Just as a long discussion with Doug Robinson is the shortest way toward conceptualizing innovative approaches in Translation Studies, so reading a new book of his is a mindexpanding experience. This definitely holds true for this book, in which he undertakes an impressive attempt to retheorize semiotranslation. One of its many intellectual merits is that he fundamentally questions our habitualized, sometimes idealized, assumptions. The author himself mentions that he loves the periphery. But some of his ideas are so central to the phenomenon of translation that they make us feel the need for a humble Semiotic Turn in Translation Studies. 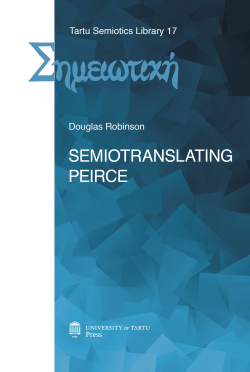 "Robinson’s book has the main merit of drawing the attention of philosophers and theorists of translation to the possible effects of Peircean ideas." -- João Queiroz and Pedro Atã, "On a Peircean Semiotic Turn of Semiotranslation", Punctum, 4(1), 2018, p. 216.